Headlong charge to destruction. 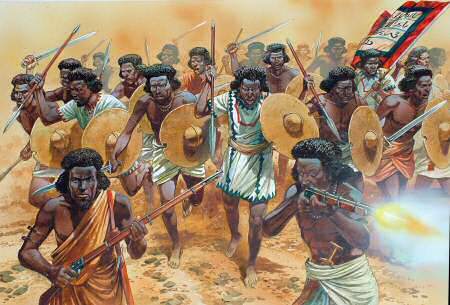 Warriors of the Ansar erupt from ambush, shields and swords adding to the terror created by bristling hairstyles and wailing battle cries. In 1881, Muhammad Ahmad Ibn As-sayyid ‘abd Allah (1844-1885), a Sudanese religious thinker, announced that Allah had appointed him to purify Islam and to strike down any government that opposed the rule of that faith. He claimed to be al- Mahdi, the prophesied saviour and vindicator of Islam, and moved at once against the government of Egypt. 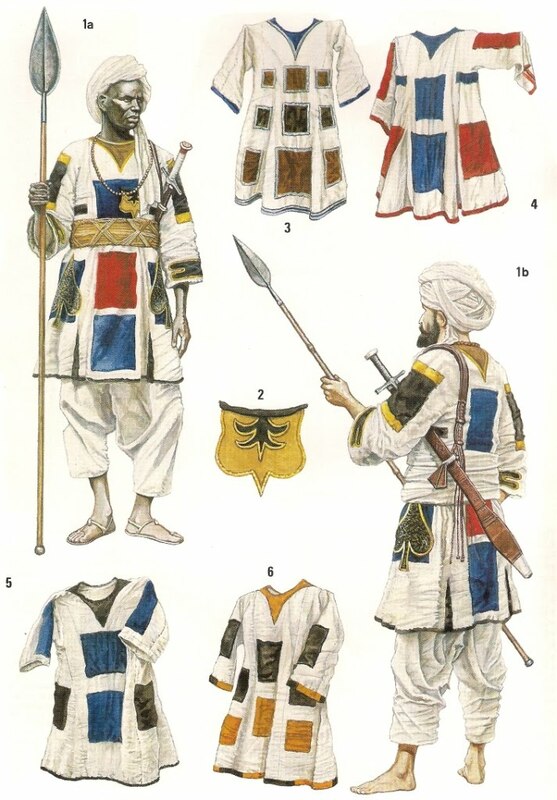 Since 1821, the Khedivate had asserted sovereignty over the Sudan and points still further south. By 1873, the British Empire had established a protectorate over Egypt, a response to the expense and strategic importance of the opening of the Suez Canal in 1869. Also, the Khedive, directed by the British, made ‘Chinese’ Gordon the governor of the Sudan. Gordon set the stage for the Mahdi’s success by disturbing a situation that has remained explosive to this day. The Arabic-speaking minority in the Sudan ruled the native black population and had made Sudan the largest remaining centre of the African slave trade. Britain’s aversion to the practice and Gordon’s ability as an administrator allowed him to destroy the traffic in human flesh, and, incidentally, Sudan’s existing economy. The Mahdi’s call for jihad found scores of thousands of willing, desperate ears, including those of Osman Digna (1836-1926). A former slave trader, he proved to be a formidable general. His Beja tribe, with their unique hairstyles, became the redoubtable Fuzzy-Wuzzies’ of Kipling’s admiring poem of 1890. Abolishing the slave trade had been nearly the extent of Egyptian plans for the Sudan, and the Khedive now considered abandoning the province before being forced to defend it. 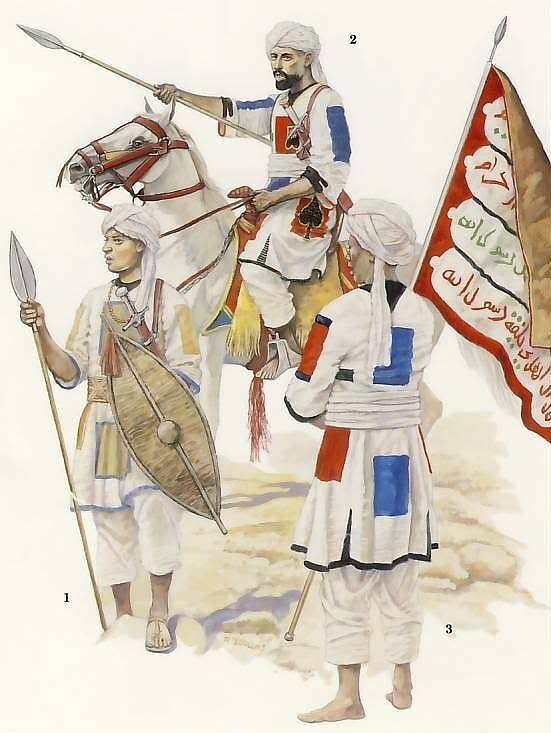 With spears, shields and jihad, Osman Digna launched furious assaults that were more than the British-officered native Egyptian levies could withstand. At Sheykan, in 1883, the Mahdi’s forces, the Ansar, slaughtered 10,000 Egyptians under the command of Lieutenant-General William Hicks (1830-1883), whose severed head became a trophy for the Mahdi. In the course of their assaults, the Ansar began to acquire a good number of Western breech-loading rifles, ammunition for which was widely available on the world arms market, along with some modern artillery. For all his proclamations of humanitarianism, Prime Minister Gladstone had always been unenthusiastic about the abolition of slavery and was supportive of the Sudanese revolt against Egyptian control. In January 1884, Gladstone sent General Gordon with instructions – and little else – to evacuate all British nationals and civilians who wished to leave the Sudan and to withdraw all Egyptian forces. Gordon’s reluctance to abandon the Sudan to the Mahdi meant that he hesitated to withdraw those forces he had managed to raise, and a month after he arrived in the Sudanese capital of Khartoum, Gordon was under siege by the Mahdi’s army. As Gordon may have intended, the Gladstone administration found that his presence in the besieged city forced it into further involvement in the Sudan. In August 1884, Gladstone grudgingly dispatched the ‘Nile Expedition’, which consisted of a slow infantry column of 5400 infantry and cavalry, some marching overland, others supported by a river fleet of cargo vessels and gunboats. Only with considerable difficulty did the expedition overcome Ansar attacks and the desert, arriving at Khartoum two days after Gordon’s severed head became the second of the Mahdi’s trophies. Under attack by some 50,000 of the Ansar, the successful retreat of the Nile Expedition to safety in Egypt represented a signal, if utterly useless, accomplishment. The Mahdi himself died of illness six months after Khartoum fell, and the Anglo-Egyptian Army was able to forestall efforts of the Ansar to expand north into Egypt. The situation with regard to the Sudanese remained largely unchanged for the next 12 years.